This morning I thought I would be a good little girl and have oatmeal for breakfast. Usually, I start the day off with a Diet Coke, vitamin, and a dose of allergy medicine. I had high hopes of improvement today. I had the big boys out the door and on the bus, the little guys were watching PBS, and the toddler and I decided to microwave oatmeal. Who needs to read directions? I have made "real" oatmeal in the microwave plenty of times, but today I decided it needed to cook for 30 more seconds. That's all it took for my microwave to get redecorated with sticky oatmeal. I now had a breakfast a minimalist would be proud of and an oozing appliance. I rolled up my sleeves and put the oatmeal out to pasture on the counter. What was I thinking, trying to change my routine? Sigh. 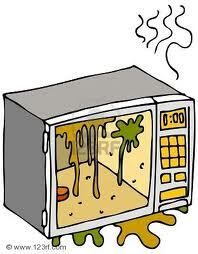 Cleaning the microwave is one of my least favorite chores. It ranks right up there with cleaning the stove after my husband cooks. With three boys and my husband in the house, I have had my share of microwave fiascoes. Over the years as a "Martha" wannabe, I have developed some shortcuts and techniques to help take the pain out of cleaning the microwave. We have all seen microwaves caked in spaghettios and mystery brown chunks. For a horror scene like that, all you need is some water, a microwave safe container, and a lemon. I use my glass measuring cup that holds 2 cups of water. I add 1 1/2 cups of water and lemon rinds if I have them. If I don't have any lemons, I add a tablespoon or more of lemon/lime juice to the water. That's it. You are set to clean your microwave. Place the container in the nightmare and microwave it for 5 or more minutes. Keep an eye on the water level, but basically you can let it boil and bubble all it wants. The steam will loosen the tidbits and sauces that have attached themselves to the interior. All you need to do is wipe down the ceiling, walls, and bottom with a rag once the insides have cooled a bit. I remove the glass tray and wash it by hand. Voila! You are now the owner of a tamed microwave that even has a clean hint of lemon scent. It's not so frightening anymore. So far this is the best option for me. I have bought cleaners which I sprayed, and scrubbed. Nothing seemed to work or else it took a lot of time and elbow grease. My method doesn't cost a lot and there are no chemicals. Now, I must turn my attention over to my oatmeal that sits in a sorry state on my counter. It's not too hot or cold, it's just right. Diet Coke would have been an easier and cleaner start, but hopefully this will give me the jumpstart I need. I want to stay awake past 10 p.m. tonight. Do you have any easy microwave cleaning ideas? commenting for the $20 amazon GC :-)... and bc i really like this post! i have so much trouble getting and keeping my microwave clean. Thanks for the great tip! Just discovered your blog. I look forward to reading more of your posts! $20 Amazon Gift Card Giveaway! Are You Suffering From March Madness? Coupons and More Coupons: Do They Pay Off?